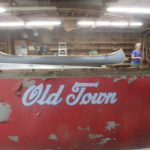 Blog - Northwoods Canoe Co. The weather outside is lovely today. 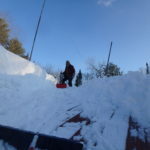 We’re expecting three to six inches of snow! And a happy spring to you all. 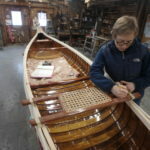 At the beginning of winter, before the snow flew, a crew from Kroka Expeditions in New Hampshire hauled up two of their 20-foot Voyagers for restoration. 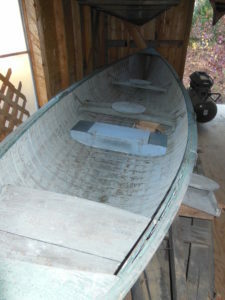 The boats needed several new ribs, gunwale repair and several pounds of sand cleaned out from under the canvas! 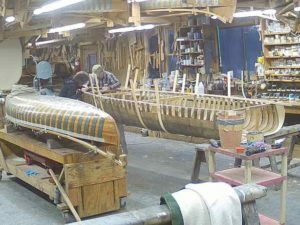 For the use that these boats get, though, on river and lake trips with hundreds of students and campers, they were in remarkable shape. 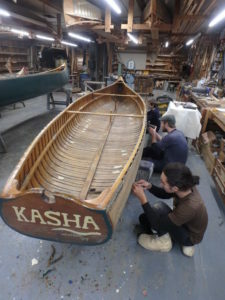 The three folks from Kroka began the job of getting them spiffed up by taking them apart. We enjoyed their visit and their energy. 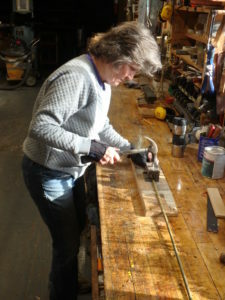 Rollin practiced his chandelier-making abilities this winter! 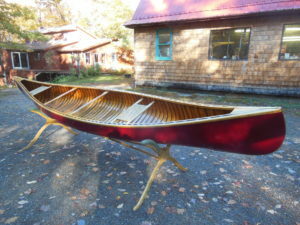 Elisa dropped off this beautiful Morris reconstruction in Everett, Mass. It now lights and decorates the great room in an apartment building there. 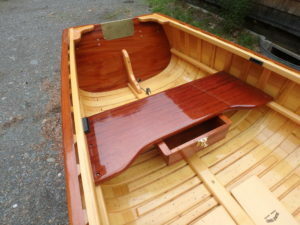 LED lights line the underside of the gunwales and highlight the color of the northern white cedar inside. 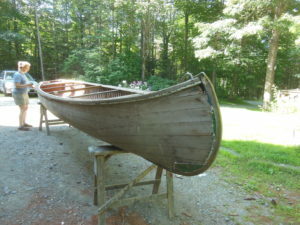 Are we sad that it will never touch water? A little. 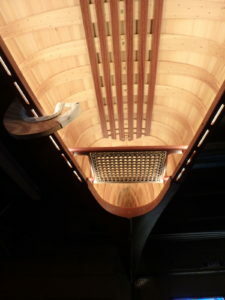 But at least many people will be able to appreciate the beauty of the Morris design when looking at it from below. 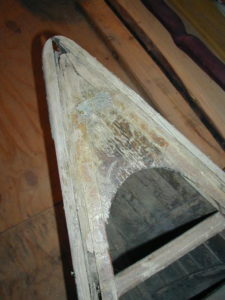 We are always in the process of renewing. 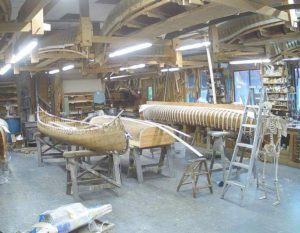 Some of the jobs are small – a couple of ribs or a new polish of varnish, a new canvas and they’re on their way. But it’s rare. Usually, we have a lot of work to do to get from this…. 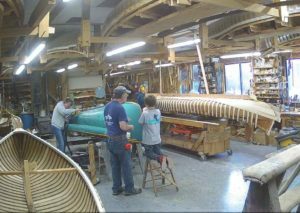 For one canoe, we used a jig to draw out and make a new stem, patched up rib tops, installed new inner gunwales and a few new ribs. 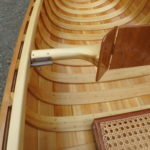 After a new thwart, new canvas and outer gunwales, newly caned seats topped off the job. 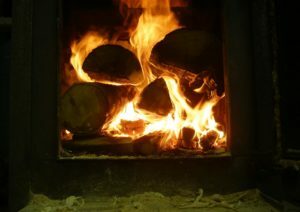 And all that in addition to drilling stem bands, keeping the fire going, and keeping an eye on the snow on the roof. At the end of it all, it’s a good thing we have a lot of comfortable places to sit down and take a break. 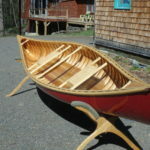 It’s warming up at last in central Maine, which means it’s time to go canoeing. Well, maybe for you! 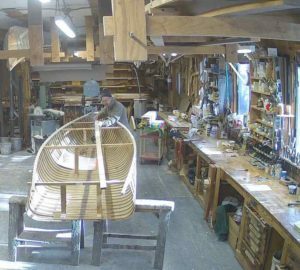 With the canoeing season in full swing, the shop is busy, busy, busy. 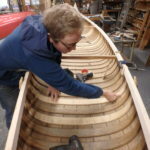 Rollin and Elisa have just returned from a successful week-long course at the WoodenBoat School in Brooklin, ME. 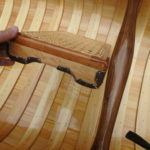 We built three different canoes with a group of 12 students and sent each boat off with a lucky winner! 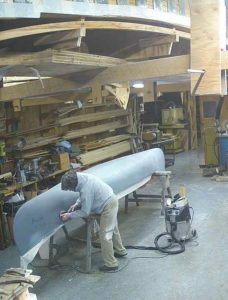 Now that we are back from the ocean, we can concentrate on shop projects. 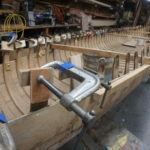 You’ll notice it’s Morris heaven right now in the shop: we have a new Morris being built and on the other side of the shop, a Morris in the middle of the restoration process. And yes, that’s the skeleton of B.N. Morris keeping watch and making sure we’re doing things right. 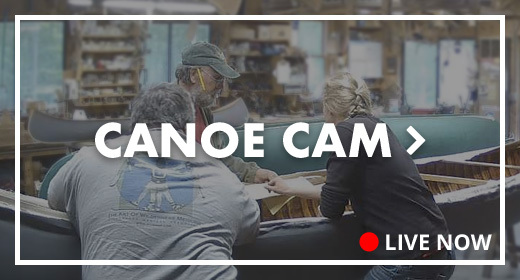 We’ve been lucky to have the whole crew in the shop this week, including one shop helper whom we only see when he’s visiting his grandfather, but he catches on quick! 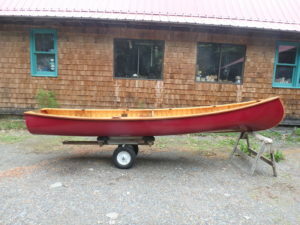 This week we’ll hand off Mr. Kaufman’s American Beauty, painted and spiffy, as you see. 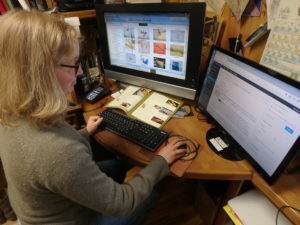 In case you were wondering, the work does not stop when the power goes out! 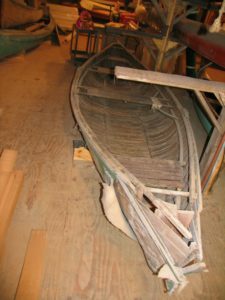 Rollins own Atkinson Traveler – shoes for the carpenters children! 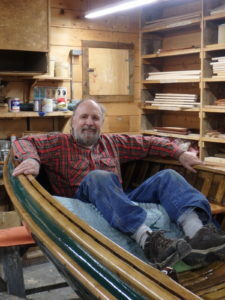 For the new year, we have a new face at Northwoods Canoe. 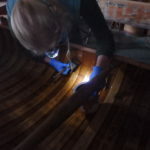 Gail D’Agostino has joined the ranks and we’re happy to have her – she’s already sanding boats! 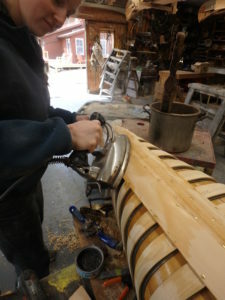 The projects in the shop are many and varied. 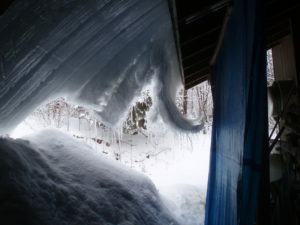 They’ve been keeping us busy in the odd moments we find between shoveling snow. 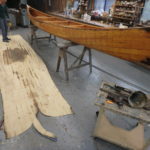 Mr. Bateman’s square-stern canoe is coming along, with new oak inner gunwales and a new oak keelson. 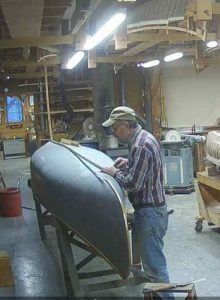 Rollin and Gail bent some new ribs for the canoe as well. 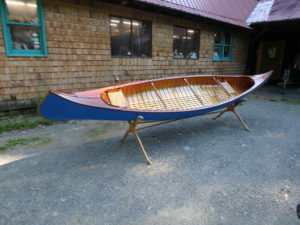 We’ve lowered a form for a new boat this week: Mr. Kaufman’s American Beauty. 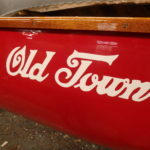 We hope to get ribs bent this afternoon! 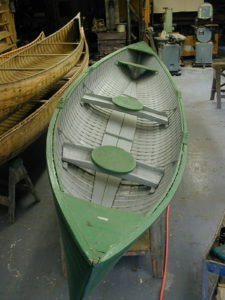 Also in the shop is the Thum Brothers’ boat, a deep Old Town canoe made custom for the Thums. 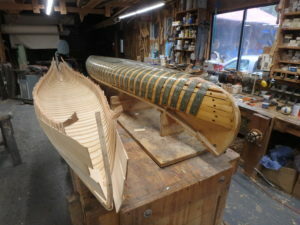 After this restoration, we hope it will see many more long canoe trips into the wilds of Canada!